ABANDONED CAT by our next door neighbours who recently moved from our neighbourhood : Rue De L’anse Bleue in Laval Des Rapides. They have another cat as well : a female who was his constant companion. She is pregnant for the second time. They kept her and abandonned him. I hope they don’t eventually abandon her as well. While the owners still lived here, I thought both cats were homeless because they were left outdoors for days and they were always very hungry and thirsty. I often found them outside my backyard eating and drinking water that was left outside for my cats when they were outdoors. Since the owners left, he was staying outside his home, all day and night waiting for them to come home, but they never did. Then he started sleeping next to my home because I was providing food and water for him. Unfortunately, he has now disappeared. I have not seen him since Tuesday, July 7th. He may still be in the neighborhood? He may be looking for his family and his companion? I don’t know. But I am very worried about him and I hope he is not lost—Parc Des Prairies is behind my back yard. I would like to help him. I would like to first have him sterilized and vaccinated. I would also like to find him a good home with responsible, loving, patient and compassionate people (or person) whom are capable and willing to care for him. Age : between 2-3 ans ??? Approachable by me but cautious with strangers. Understandably sad, angry, lonely and confused. 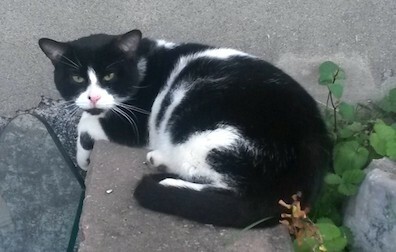 Next Post: Black cat found in Ville-Marie – family found!